Who, what, where and why? These are questions I ponder about a lot of things in life and none more so than when I am reading one of my favourite blogs. I often think about the person behind the words I am reading and just like I do when I am engaging in people watching, I imagine where they were when they wrote it, what motivated them and what inspired them to write it? 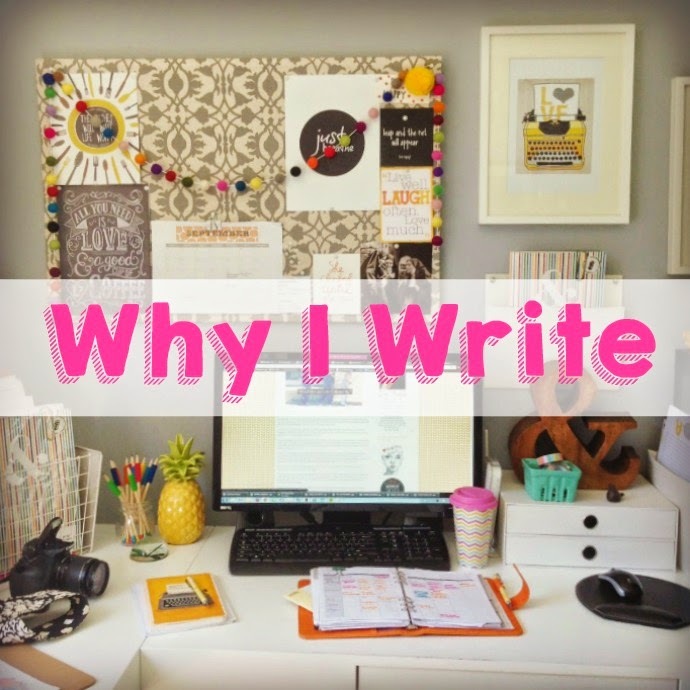 I am joining in the recent blog hop to do the rounds - the Why I Write. The baton was passed to me by my gorgeous bud Sonia from Sonia Styling. You can read her post here to get an understanding of what motivates Sonia to write. Today it is my turn to share or over share with you guys before I officially stumble across the marker and pass the baton to some of my fave bloggers to run with. As is the usual way with me I have a load of things on the boil at once. In addition to the daily ramblings on my own blog I write for a number of different companies / websites and the topics and type of writing I do for them ranges from tutorials to basic parenting commentary, interview style pieces and your run of the mill copy writing. I have a few sponsored posts in the works at the moment and when I write these I always need to wait for the inspiration to hit me in an organic way. The story needs to develop naturally because a forced sponsored post kind of sits in my stomach like a week old tuna sandwich would. It just doesn't feel right, which is also why I tend to be picky with what sponsored posts I agree to do. For me inspiration usually slaps me in the face at the eleventh hour and the story comes to life in the final minutes before the deadline strikes. A nightmare for my agent and the companies I write for I suppose, but an even bigger nightmare for my stress levels. Like millions of other writers, I am also working on a book. Two books actually. One is a light hearted fictional chick lit and the other is a non fiction. The fictional book has the most awesome characters who are fun to slip into character with, but it doesn't get nearly as much time or effort as I would like to be able to give it. The non fiction is deep and raw and at times utterly exhausting and so I work on that in bite size chunks when I feel strong and brave enough. I don't know that my writing is really any different from others, it's just my voice is different because all of our voices are different and individual in their own unique way. That's what makes the blogosphere interesting - the humongous melting pot of voices. My writing reflects how my mind works and how I think - which is typically pretty random and all over the place. I write with the same voice I would if I were to be speaking to you face to face. Sometimes quietly and slightly unsure of myself and at other times completely loud, unfiltered and often inappropriate. Because I fell in love with the freedom one has to express ourselves via the written word. Writing is a gift to anyone who suffers from anxiety or insecurities as it is sometimes easier to write what I feel than it is to say it out loud. I also love the way writing on the Internet connects us on a personal level with people we would never have crossed paths with in any other way. Most of all I write because I generally have a lot to say. I have a number of different methods to my madness. I write when inspiration hits, which can be completely impractical at times. There have been many light on light off moments at night and numerous occasions I have climbed out of the shower and run naked to my bedside table to quickly note a thought before it disappears into the abyss that is my mind for like ever. I will write anywhere and at anytime and I have notebooks in all my bags with thoughts scribbled into them. I also use the voice memo app on my phone when I am in the car. The peace and quiet of driving alone in the car usually ignites a good old conversation with myself. But instead of keeping the discussion in my head, I have that conversation out loud and record it with voice memo. I can then translate that later into a blog post if I feel so inclined. And yes - I am aware that makes me sound like a complete nutjob. I tend to have a schedule for the week I follow. I try to build in time to do at least one project, and the others slots are dedicated to whatever thoughts or ideas are tickling my fancy at that time I sit down to write. I have a number of different places around our house that I like to write in, but depending on the season and how many people are at home and how noisy they are being - these are the usual four spots you will find me. Okey dokey artichokey - it's time to pass the blog hop baton on to a couple of my fave bloggers who will share their story with you next week. Chris Carroll is the stylist and writer behind The Life Creative – an Aussie blog that takes a light-hearted look at interior design & decor. 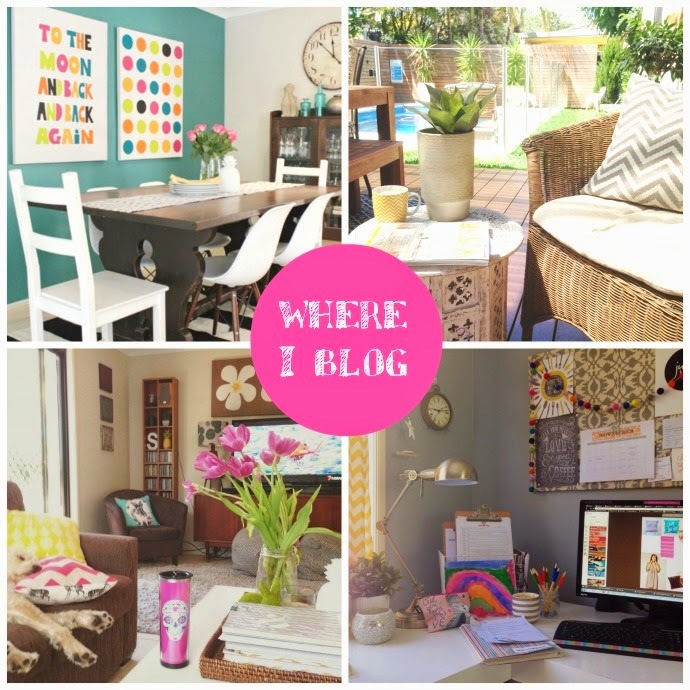 Since its beginning in 2012, the blog has fast become known as a local hub for homewares, interior styling, crafting, DIY and stationery inspiration. 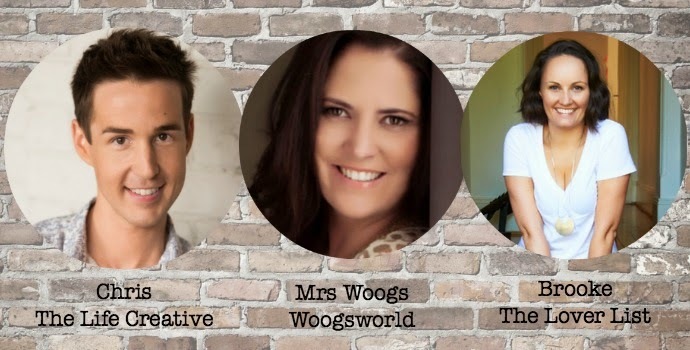 In the short time since Chris began TLC, he has been featured in a variety of publications including Real Living and Inside Out, along with recent appearances on The Morning Show as a home decor expert. Chris celebrates having fun with design and encourages embracing individual style, holding a firm belief that everyone is capable of living a creative life. The blog is interactive, his design advice is easy to digest and he never shies away from giving something creative a go. He may also have a slight obsession with cushions, candles, colour and cats. Are there any other obscure household jobs you get your kids involved in? I can be found in the laundry, folding laundry, sorting laundry and dropping off the dry cleaning. I am mum to two boys, advisor to my husband and master of a cat and two guinea pigs. I am a procrastinator, disorganised, avoider of conflict, scared of technology, an excellent interpretive dancer, an average cook and of course, a blogger. I like to read cookbooks and eat out. I like to critique fashion magazines while wearing tracksuit pants on the couch. I do not like Pina Coladas, nor walks in the rain. I will take a gin and tonic in front of an open fire every single time. I am a columnist for The Hoopla and appear on Channel 7′s The Daily Edition weekly, where I am allowed to air my opinion on national TV! I think about going to the gym every day. Brooke Osborne, a.k.a The Lover, is a fun-loving city gal bursting with creativity and enthusiasm for life. Her passion for paws, positivity and pasta has earned her a loyal following on The Lover List with young women all over the world, casting their eyes over her every post. Ms Lover’s mission is to dig deep on topics that some of us dare to talk about, inspire others to take a leap of faith, provide laughter when the world can feel stale and inject a whole lotta love into every day. Do you love to write? What motivates you and where do you like to write from?